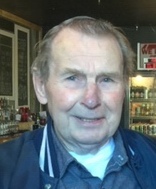 Duane “Sam” (Robert) Donat, 84, died at Sanford Bemidji Medical Center in Bemidji on April 1, 2019. Funeral Services will be 10:00 a.m., Friday, April 5, 2019 at the Olson-Schwartz Funeral Home. Visitation will be one hour prior to the service at the funeral home. Interment will be in Nary Cemetery, Nary. Duane was born March 10, 1935 to Anton (Joe) and Mary (Walker) Donat in Upsula, Minnesota. Early pictures of Sam show him with hunched up shoulders and a sly grin on his face. His quick wit and hearty laugh were signatures throughout his life of 84 years. He grew up in the St. Cloud area where he met and married Shirley Kipka in September of 1959. Together they raised two daughters, Sheri and Sandy (Shannon Raue), both of Laporte and son Steve (Cat) of Bemidji. They lived in the north Metro area and moved to rural Bemidji in 1974 where they owned and operated The Donat Hole until they parted ways in 1981. Sam met Janice Trepanier in 1986 with whom he shared and enjoyed the rest of his life both in Arizona and Minnesota. He formally retired from driving truck over the road in the late 1990s but continued to drive potato truck, motor homes, pontoons, golf carts, tractors, lawnmowers and the occasional casino or bar stool. A complex and skilled man who lived simply by enjoying sitting by the fire, petting the animals, playing cards, golfing, fishing and telling stories. Whether teaching a child to tie a shoe, relaxing by tying a lure or perhaps simply tying one on with family, friends or strangers, he taught with patience, he lived with joy and he loved with grace. Along with his parents, he now rests with brothers Sylvester, Donald, Gene and Dale, sisters Beatrice Marty and Lila Jean Connant. His memory lives on in the heartbeats of his children, granddaughter Andrea (John Dalton) of Bemidji, brother Daryl of Clayton, Delaware, sister Arlene of Columbia Heights, Minnesota, Janice and her family and his nephews, nieces, cousins, in-laws and other family and friends. His peaceful departure on April 1, 2019 found him surrounded by those he always embraced with loving arms and that just about does it, Donat.